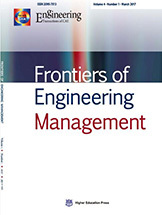 Frontiers of Engineering Management is a research journal sponsored by the Chinese Academy of Engineering, administered jointly by Higher Education Press, Tsinghua University and Huazhong University of Science and Technology, and published by Higher Education Press, China. The journal is international in its scope and mission. It is published quarterly in English in both print and online versions. Frontiers of Engineering Management provides a high-quality international platform for academic researchers, industry professionals and other constituent communities in the broad field of engineering management to impart and share the latest research results and knowledge in the form of research articles, reviews, letters and comments. Green management in construction has become an important issue in strategic management, both practically and theoretically. Green management in construction refers to green practices and procedures used in the whole construction processes, by integrating green ideas (i.e. environmental protection, energy saving, carbon emissions and pollution reduction) to meet the sustainable development requirements. On one hand, the green practices in the construction industry have largely improved the development of green management. On the other hand, the question of how construction companies can reduce energy consumption and carbon emissions so as to decrease their projects’ impact on natural environment and increase their competitiveness has been a central topic in green construction literature. To submit a manuscript, please visit https://mc.manuscriptcentral.com/fem. Under “Manuscript Type”, please select “Green Management in Construction”. All manuscripts will be peer-reviewed in accordance with the established policies and procedures of the journal. Papers will be selected for publication following the outcome of the peer review process and subsequent decisions of the Guest Editors and the Editor-in-Chief.